Yes, I know this is sideways, but I am in a hurry! Friday... I will be the only one at work since the other 2 gals took off for the holiday. I am taking the July 4th holiday on Columbus Day, after Festival of the Goddess. This is a series of cards I made using the same paper on each..a theme, if you will. The latticework bird (top left in pic) is actually using a felt coaster. I'm safe, up high.... ah, Pink! What a way to get moving in the morning. So, this card is a cream base, green paper that was run thru the Sizzix with a texture plate, a punch that started life as a backing sheet for some stickers I bought, a sticker on that, some ribon & RS the sentiment in VersaMark, sprinkled w/EP & heat embossed. Thursdday... the day I go pick up a catalog and some stamps from Stampin'Up (SU) demonstrator Terry Foley! 'Course, have to get through work 1st. Sigh. Then home to finish working on some ATC sets I have due out next week. Also, since Rebel is home, going to get him to start digging our compost pit so I can empty the containers in the fridge. Coffee grounds, egg shells, raw veggie remains, newspaper, etc will land in there instead of the trash can. The inspiration for this card was Janee Ward. She had been trying new pencils on some textured paper & they were just not doing what she had expected. So, she tore up the attempt, switched pensils, and went on her way. She asked if I could recycle the scraps... and this is what one of them became. In our current economic situation, every little thing we buy or do affects someone else and perhaps even their job. Remember when Walmart's theme was "Made in America"? Try finding that label now in that store. Most of their goods are imported from China. Look at the labels EVERYWHERE, in every store. It pays to read labels. Take Hershey's candy. .. is now made in Mexico. Colgate toothpaste, too. I use Crest instead...at least as long as it is continued being made in the USA. 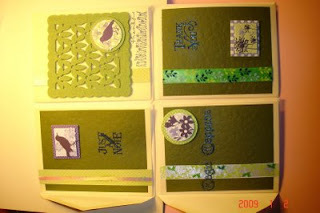 WAAAYY too tired to get going today...sigh.... DSP, wall stencil stamp, RS & punch flower center, frog is a diecut.